Earthworks' patented technologies incorporated into the FlexMic Series provide a high level of speech intelligibility and uniform off-axis response to ensure the orator is heard clearly, with no loss in sound quality, when speaking at the front or at the sides of the microphone. This smooth off-axis response also provides more gain before feedback. With 145dB SPL max acoustic input, it is virtually impossible to overload the microphone. There is also high rejection of sounds from the rear of the microphone, with no handling noise in addition to incredible RFI rejection. 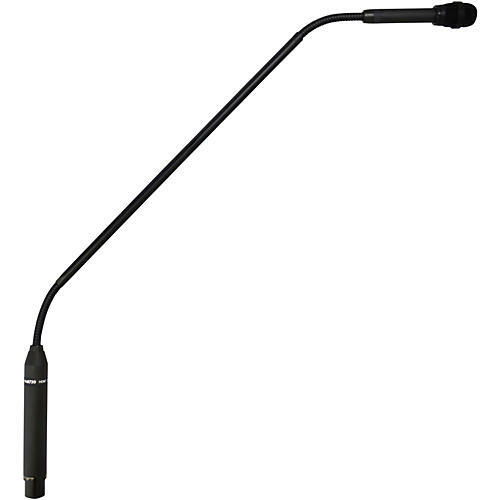 Designed specifically for use as a podium microphone, the FlexMic Series offers numerous versatile features and options that make these microphones ideal for public speaking venues including lecture halls, presentation spaces, churches, civic centers, theaters, and government facilities.